We do not plow the fields or toil in the mines! We take what is ours! The scene from when both Greyjoys say they are going to build the biggest fleet. There is even one scene where Euron Greyjoy tells the women to sew the sails and the men to start bending planks. Here is the scene of them proclaiming to build these 1000 ships. According to this, they take/steal and plunder what they need to live, so why are they so inclined to "build" their fleet of 1000 ships? Is there something in the books or somewhere else that states why they do this? Or is it just that the show comes across too literal and the fact is they do do certain forms of labor? So should they not be stealing the fleet? Or is building it part of what they do as Ironborn? There are also ships in Westeros, but there seem to be many more on Essos. See below. In Qarth, the Thirteen control about 1,000 ships, the Ancient Guild of Spicers own about 1,200 or 1,300, and the Tourmaline Brotherhood has about 800. In Braavos, the Sealord commands a fleet of warships second to none, and a mercantile fleet whose purple hulls and purple sails have become a common sight throughout the known world. The Arsenal of Braavos can reportedly build a war galley in a day." This is going to need some context and a brief overview of history. As you know, Iron Islands are, well Islands. To maintain trade, to raid, to conquer and to defend their Isles, like any other Island nation the Ironborn need a strong naval fleet. The lands of the Iron Islands are extremely poor. They are mostly barren and those that aren't are often plagued with storms that destroy whatever they could hope to sow. The people lack even the basic domestic animals to help them sow crops and the Iron Islanders often have to do the tilling and other stuff themselves. If not for the Fishermen (Estimate by Archmaester Haereg is that 7 out of 10 families in Iron Islands are Fishermen), the Iron Islanders would have starved to death long time ago. All these differences, Archmaester Haereg asserts in his History of the Ironborn, are rooted in religion. These cold, wet, windswept islands were never well forested, and their thin soil did not support the growth of weirwoods. No giants ever made their homes here, nor did the children of the forest walk what woods there were. The old gods worshipped by these elder races were likewise absent. And though the Andals did reach the islands eventually, their Faith never took root here either, for another god had come before the Seven: the Drowned God, creator of the seas and father of the ironborn. Furthermore given the condition and the size of their lands, it is possible that they are perhaps just as small a Population as the Dornish, if not more. Their mines yielded none of the precious and profitable minerals. Poor in aught else, Iron Islands are rich in Iron, Tin and Lead mines. These ores were used to make weapons for the raiders. What was missing now, was the wood to make ships. Once that was done, The Greenlanders would be kneeling in their septs and Godswoods praying "From fury of the Ironmen, Oh Lords deliver us". 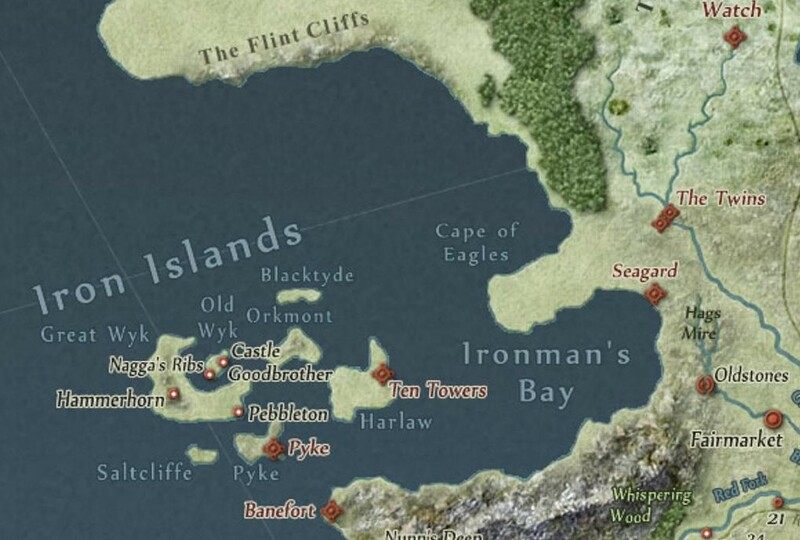 Such riches as the Iron Islands possess lie under the hills of Great Wyk, Harlaw, and Orkmont, where lead, tin, and iron can be found in abundance. These ores are the chief export of the islands. There are many fine metalworkers amongst the ironborn, as might be expected; the forges of Lordsport produce swords, axes, ringmail, and plate second to none. The soil of the Iron Islands is thin and stony, more suitable for the grazing of goats than the raising of crops. The ironborn would surely suffer famine every winter but for the endless bounty of the sea and the fisherfolk who reap it. The Days of the Old way: What happened and why? In the old days, when Ironborn were just starting sailing, there were great forests in Great Wyk, Harlaw and Orkmont. But since Iron Islanders needed ships to take everything else they needed, those forests took so much damage that in the end those forests were wiped out. It was at that moment that the Ironborn, until then content with raiding, turned to conquest. There were plenty of forests in the Mainland and Ironborn wanted them. Archmaester Haereg has argued that it was a need for wood that first set the ironborn on this bloody path. In the dawn of days, there were extensive forests on Great Wyk, Harlaw, and Orkmont, but the shipwrights of the isles had such a voracious need for timber that one by one the woods vanished. So the ironborn had no choice but to turn to the vast forests of the green lands, the mainland of Westeros. All that the islands lacked the reavers found in the green lands. Little and less was taken in trade; much and more was bought in blood, with the point of a sword or the edge of an axe. And when the reavers returned to the islands with such plunder, they would say that they had "paid the iron price" for it; those who stayed behind "paid the gold price" to acquire these treasures, or went without. And thusly, Haereg tells us, were the reavers and their deeds exalted above all by singers, smallfolk, and priests alike. Their small size, lack of suitable lands to sow crops, lack of any precious minerals and harsh weather are precisely why the traditions of raids developed in the Iron Islands. The Greyjoy words may be "We do not sow" but a more precise phrasing would be "We can not Sow" which was given a heroic makeover to attract the youth of the Iron Isles to take what they needed to survive by raiding others. As the population is presumably very small and the role of raiders is essential for their survival, The Ironborn also capture captives who they then enslave to work their mines while the native population is focused on raiding and sailing. That's why they now hold those professions in contempt, because their thralls used to do that. They seem to have forgotten the days when they themselves did all that until the raiders started bringing slaves. Now at that moment, the coastal lands of the Western Westeros were thinly populated. And none of the Kingdoms on the coasts had developed shipping technology on par with the Ironborn. At best they could come up with cogs and small boats which were not able to challenge the Ironborn longships on open seas. When Winter would hit, Ironborn would strike to find food for their people. The raiders did so well that they fed the entire islands in the Winters. That's how "We do not sow" became Greyjoy slogan. The lands the reavers plundered were densely wooded but thinly peopled in those days. Then as now, the ironborn were loath to go too far from the salt waters that sustained them, but they ruled the Sunset Sea from Bear Island and the Frozen Shore down to the Arbor. The feeble fishing boats and trading cogs of the First Men, which seldom ventured out of sight of land, were no match for the swift longships of the ironmen with their great sails and banks of oars. And when battle was joined upon the shores, mighty kings and famous warriors fell before the reavers like wheat before a scythe, in such numbers that the men of the green lands told each other that the ironborn were demons risen from some watery hell, protected by fell sorceries and possessed of foul black weapons that drank the very souls of those they slew. Whenever autumn waned and winter threatened, the longships would come raiding after food. And so the Iron Islands ate, even in the depths of winter, whilst oft as not the men who had planted, tended, and harvested the crops starved. "We do not sow," became the boast of the Greyjoys, whose rulers began to style themselves Lords Reaper of Pyke. Now since they had a supply of slaves who they set to farming and mining, the opinion of those professions took a hit in the Isles. They were jobs fit for thralls and slaves exclusively, not for any Ironborn. Contrary to that, Ship-wrights remained exclusively Ironborn. The raiders were the highest regarded folk in the Isles and could there be any raids without the Ship-wrights building them ships? They were the backbone of the new culture and traditions of the Isles, whose lynchpin was raiding. With successful raiding, the economy boomed. With the influx of the Salt-wives, the population boomed as well. Now was the time to seek permanent settlements in the Greenlands. And so the Ironborn went to war again and the Firstmen, helpless before their naval might, either abandoned the shorelines or paid tributes to keep their crowns. But of course, situation doesn't remain the same forever. Eventually the Firstmen learned how to build longships and then the Firstmen resurgence began. Gardeners and Hightowers were the first who stopped paying tributes and others followed their lead. The Lannisters went even further and became the first Mainlanders to raid the Iron Islands themselves. The tables had turned. Anyhow eventually the Ironborn were thrown back to their Isles by the Targaryens and were forced to bend the knee. They were beaten but their traditions remained intact. In the early days, the Ironborn had the best maritime technology, they did not need to steal poorly constructed vessels of the First Men. In current timeline, The ships of the Mainlanders are larger and more formidable than the Ironborn vessels but the Ironborn vessels are faster, more durable and have better crews. That however doesn't mean that they could go and capture a whole military fleet without battle. And in a battle, they would be severely outnumbered and outgunned (Out-axed?). They do steal Essosi trade ships etc on open seas when it is convenient but military ships are a different sort of beast. It is near impossible to capture a fleet without battle and in battle, many of them would be severely damaged. That doesn't mean they do not capture military vessels that surrender or are overwhelmed. But capturing isolated vessel or remnants of a defeated fleet is different than let's saying dropping in some commando-style units behind enemy lines and have them take over an entire fleet at anchor. They won't likely be left without a crew and the port defense would make it impossible for the infiltrators to get away without the whole fleet sailing into battle position. That's also why even when Euron sneaked close to Lannister fleet during Greyjoy rebellion, he merely set them on fire as he had no hope of taking them over without a battle and in a battle his chances were grim. So he just took the Lannisters by surprise and temporarily dealt with the threat their fleet posed to the Iron Islands. Of course the Lannisters quickly built another fleet and joined the Royal fleet where they together smashed the Iron fleet and destroyed the rebels. The boast of "We do not sow" is just that. If the Ironborn had any better alternative, they would not have become brigands. They may boast all they want but without the Tillers, Miners and Fisherfolk, they would all die. Building ships is one of the proud traditions of the Iron Islands.It is not considered a menial profession like farming and mining. Their ships are fast and strong. It is unclear if the craftsmanship of other nations compares to theirs. Note that as per the traditions of the Iron Islands, the thralls were forced to work the fields and the mines but the Shipwrights have always remained Ironborn. You need a fleet to capture a fleet in the first place when you are an Islander. Ironborn prophets and priests are yet to perform the miracle of splitting the sea, to allow the Ironborn walk to the nearest Mainland port and steal the ships. Until that happens, they need the ships. Ironborn do capture odd, isolated merchant and military ships after naval battles and chase. They have never captured entire fleets using land-based parties however. There are multiple reasons that I can think of, of why you'd build an army rather than taking one. The Ironborn are the main power of the seas around Westeros, it's hard to command them if your ships come from somewhere else. Eventually wherever your ships are coming from are going to have the same power as you, know your weaknesses and know your ships better than you. The Ironborn are a naval nation so it makes sense for them to have started ship building anyway. Once you gain the skills to make a powerful naval force you don't just stop because you can get your ships elsewhere. In fact getting their ships elsewhere likely meant getting ones of lower quality. 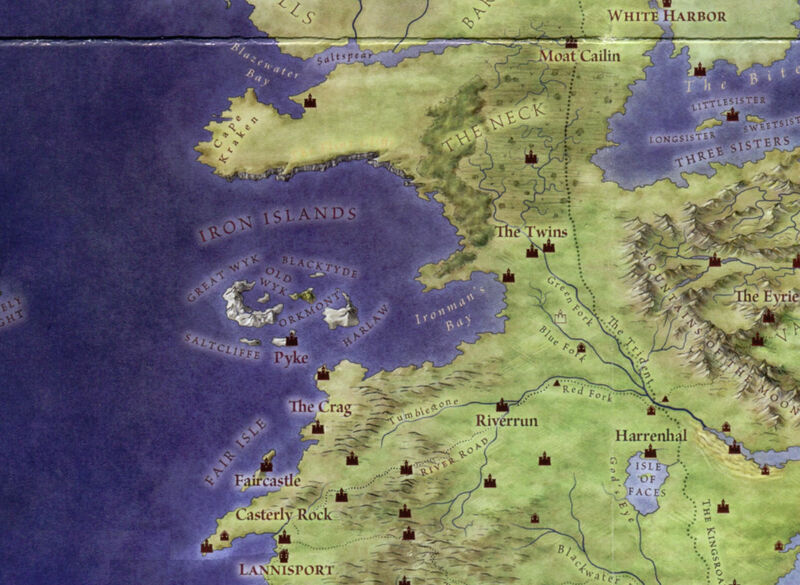 The Iron Islands are, obviously, islands separated from the main land of Westeros. To be able not to sow in the first place they have to be able to get elsewhere, this requires ships. There aren't many materials on the Iron Islands for ship building and those that were there have been used up. However, there are plenty of materials on the main land for ship building that they have easy access too. It'd be a shame to get ships elsewhere with such a readily available source nearby. People don't just give up ships and there is always someone bigger than you with better ships, especially if you rely on taking ships. Note that Lannisport is only slightly south of the Iron Islands and they wouldn't be willing to give up their ships without a fight or let others in their lands have the same fate as theirs. It's also worth noting that to be able to take ships you have to be able to overpower them or take them stealthily. Stealth isn't the way of the Ironborn and so they are left with the first option. They need to overpower the enemy and to do that you need a powerful fleet of your own in the first place. The Ironborn obviously needeed ships in the first place to live on the islands. With no land to farm, they probably relied (and still rely) a lot on fishing. Sailing must be second nature to them, and it makes sense that they take pride in building ships, as well (as the Vikings did). As there doesn't seem to be any forests on the Iron Islands, they probably steal the wood they need (for building houses as well as ships) from coastal forests in mainland Westeros. Maps show sizable forests just inland, between the Flint Cliffs and the Cape of Eagles, westward of the marshlands of The Neck, with little habitation nearby. That seems like an obvious source for wood. You need to have ships to take ships. It has already been mentioned that they are an island nation, but even if they were not, it would be challenging to "steal" any great quantity of ships by land. Typically, one would have to get through a city or town's guards first (since most ships, when not at sea, are docked at a major port), and by the time one made it through the ground forces, the ships [if possible] would have set sail so that they were not vulnerable to land attack. He [Victarion] gave the captured ship to Ragnor Pyke, named a dozen men to crew her ... [then said to] Nute the Barber ... "I want a count of the ships we won" (pp. 612-13). He had lost six ships, and captured eight-and-thirty. "It will serve," he told Nute (pp. 618-19). How many were warships versus other types of ships in the area is not noted, but certainly some were, with probably a larger portion of cogs, trade vessels, etc., having been captured (some of the enemy warships no doubt sunk, and proportionally, there are probably less warships as opposed to other types of vessels). The longships are distinctive. The Ironborn longships (like the Viking longships) are a unique type of warship, and so have different properties (shallower draft for one) useful for making raids far up rivers and along shallower waters in coasts and bog lands. So they need to build those ships if they want to maintain their distinctive way of raiding and plundering. Does Euron have “magical” support that helped him build 1000 ships? Why does Sam get away with stealing this prized artifact?